but where o’ where are the 21st century Minutemen and Continental Army? REALITY CHECK: Look it, people, Trump can’t do this by himself. doing battle with an endless procession of swamp monsters. The CCRG has written extensively about the many “striking parallels” between the American Revolutionary War and the unfolding Second American Revolution. There are very good reasons for this as explained in the following excerpt from January of 2016. “Even the stars portend striking parallels between the revolutionary spirit of 1776 and the upcoming Revolution of 2016. Every knowledgeable astrologer will agree that the 1770s saw the planet Pluto cruising through Capricorn just as it has been since 2008. This particular transit only occurs once every 240 years and does not bode well for those who populate the establishment. Particularly in 2016 — the Chinese Year of the Fire Monkey — will there be plenty of fireworks throughout the USA. The critical point is that 2016 really did mark the beginning of the Second American Revolution with the justifiably rebellious election of Donald J. Trump, just as the American War of Independence began with the signing if the Declaration of Independence in 1776. Only with this crucial understanding can the tumultuous events of 2017 be properly comprehended and interpreted. In fact, the United States of America is at war. Not only at war abroad unlawfully invading foreign nations, but also at war at home. There ought to be no American alive today who does not experience the profound conflict which is being waged in all 50 states 24/7. This is not just a culture war; rather, it is an epic battle for the heart and soul of the nation. All anyone has to do is substitute Deep State for the British Empire in order to fully grasp the current state of affairs vis-à-vis the First American Revolution. Deep State includes the old British Empire, the new American Empire, as well as a hidden global network of command and control that is unmatched in human history. Truly, if ever a wrecking ball was to incarnate into human form, Donald Trump would be the perfect one. His photograph now sits next to the phrase “wrecking ball” in Webster’s Dictionary. That would be a highly destructive yet necessary wrecking ball knocking down Deep State. • Trump wrecked the little party held by the RINO’s who hijacked the Republican Party. The GOP is still floundering as never before from all the wreckage left in the wake of their Trumping this past campaign season. 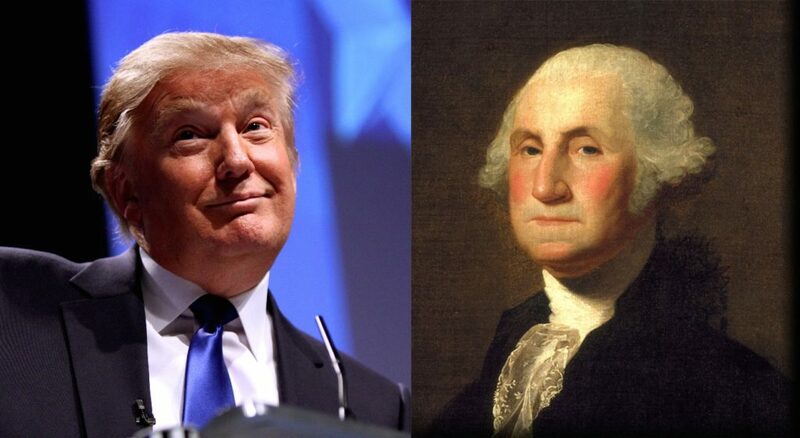 • Trump wrecked the once all-powerful Bush Political Dynasty—for good! • Trump wrecked the Clinton Crime Family—for good! He also wrecked their fake NGO known as the Clinton Foundation. • Trump relentlessly wrecked the decadent and depraved Democratic Party during the same campaign season, as he continues to today. 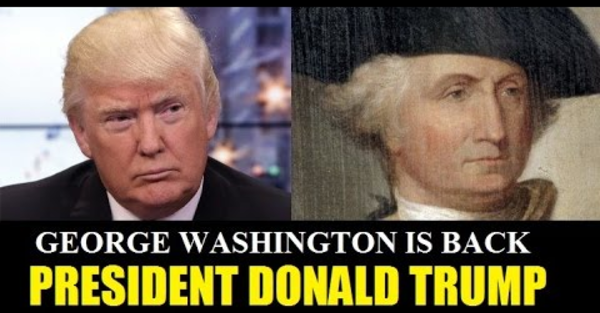 • Trump has wrecked the Mainstream Media (MSM) like no person in U.S. history… as well as world history. He’s still wrecking them, and we ain’t seen nothing yet. • Trump has wrecked the U.S. electoral process by exposing the election theft and fraud that occurs every 4-year cycle without fail. • Trump is wrecking the 17 intelligence agencies in ways that are not yet known. He is revealing their daily sedition with every proclamation about their well-known perfidy and treason and untrustworthiness. • Trump is wrecking a LOT more than this, much of which is taking place under the radar. The damage he has inflicted 24/7 to various rogue U.S. agencies and institutions is as profound and fundamental as it gets. Has any other individual accomplished so much in a mere 2 year period ending June 16th of this year? Well, has anybody? No…there’s not even anyone else in sight. 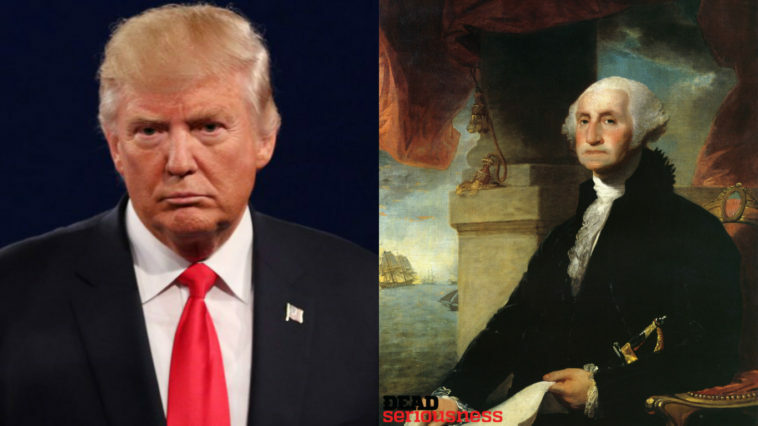 There are a number of extraordinary similarities and ironies in this comparative analysis between George Washington and Donald Trump. There are even some apparent contradictions as the following list indicates. George Washington retreated his way to victory over years of fighting the British during the American Revolution. Donald Trump goes on the offensive every day that the impulse emerges and often wins in his own unique way. Donald Trump is accused of telling lies hourly according to groundless media allegations and utterly fake news. George Washington inspired great loyalty among his troops in the Continental Army. Donald Trump galvanized the nationwide patriot movement because of his popular message. George Washington was well-known for his true grit and raw courage in the face of a formidable enemy. Donald Trump took on Deep State when few even knew about it and exemplifies bravery of the highest order. George Washington. was a member of the wealthy landed gentry who led the colonists to a highly implausible victory over British military might and tyranny. Donald Trump is a rich and powerful businessman who used his influence to lead the common man to an improbable electoral win for nationalism over globalism. George Washington fought with the Continental Congress for support and resources every day of the American Revolution. Donald Trump fights with Congress for any support whatsoever as he does battle even with his own party. George Washington established an elaborate and highly effective network of spies in the New York and New Jersey colonies. Donald Trump is the victim of unprecedented spying and surveillance both as President and as a private person. George Washington assembled some of the greatest generals of the era, some from Europe, who collaborated closely to defeat the British. Donald Trump has surrounded himself with flag officers and other experienced military men who understand the inner workings of Deep State. George Washington was known to be a restrained and pensive man with a commanding presence yet humbled demeanor. Donald Trump is universally recognized for his towering ego and blistering verbal barbs which are often tempestuously tweeted in the dead of night. George Washington was an exceptionally self-sacrificing American patriot and heroic leader of the Continental Army who risked his hearth and home, life and limb toward the establishment of the American Republic, free of British despotism. Donald Trump is an exceedingly determined American patriot and Commander-in-Chief whose gutsy courage and legendary truth-telling have led the USA to the ongoing emancipation from the tyrannical U.S. Government and British control. During times of war anything goes, including treason and sedition, subterfuge and sabotage, spying and surveillance, perfidy and betrayal, murder and assassination. Washington faced all of these on a daily basis, as does Trump today. However, there’s one major difference between then and now. The vast majority of colonists were totally behind the War for Independence. And Washington formed a respectable army with a remarkably small budget. The fledgling institutions of the Thirteen Colonies were firmly on the side of revolution, as were various foreign nations who also wanted to see British imperialism resoundingly defeated. Moreover, various urban centers of America have become uncontrollable caldrons of unlawful Bolshevik insurgency. Just like the Revolutionary War period, these traitors and anarchists are being egged on by the globalist banksters in London. The social fabric of American society was so torn by Obama that the culture war set the stage for the current simmering revolution. base and experience set in dealing with the ever-intensifying British treachery. all the help he can get. If ever the POTUS has needed his “Praetorian Guard”, it is now. He may also need his troops in the U.S. Armed Forces to come to the defense of the Republic in the not-too-distant future, should the developing coup d’état become violent. With the long-overdue firing of FBI Director James B. Comey, Trump has incurred the wrath of Deep State, and well as other powerful entities. Consequently, he is under persistent direct attack like no other president is U.S. history. Even John F. Kennedy didn’t have to face the ugly antagonism and unwarranted persecution that Trump confronts daily since he entered the Oval Office. In view of this worsening predicament, if this President is to survive the year in office, the Trump movement is compelled to make a serious show of support. The cowardly Bolsheviks who now populate the Democratic Party only know demonstrations of force, unfortunately. Their increasing violence needs to be met with unambiguous strength or else Trump will eventually find himself in a “Maidan Square” type situation. That coup in Kiev was also a violent CIA-coordinated protest which led to the overthrow of the Ukrainian government. The American people are now watching a live, bloodless coup-in-progress in the nation’s capital. Just as they witnessed a bloody coup d’état in Dallas on November 22nd, 1963, it takes but a moment for Deep State to execute a real game-changer. This is undoubtedly their intention where it concerns the Trump presidency. For the profound disruption that Trump has caused to the political/governmental status quo has become intolerable to the professional political class. Not only is Trump’s spontaneous truth-telling completely without precedent, his unpredictability is driving the establishment crazy. Were the American people to understand the gravity of this rapidly evolving stealth insurrection against the democratically elected POTUS, they would respond with all deliberate speed. Not to do so puts the American Republic in great jeopardy as it puts the future of the citizenry in grave danger. Perhaps if the patriots were aware of the true forces behind the gathering storm that quickly approaches, they would react accordingly. However, the body politic as a whole seems incapable of grasping the enormity and profundity of the president’s plight, and its true significance for the world-at-large. Whether the agents of Deep State are successful in their most recent seditious enterprise remains to be seen. Nevertheless, they will not cease in this endeavor until President Trump is frogmarched out of the Oval Office. And they have no concern whatsoever about the legitimacy of their actions or how the public perceives those who implement their transparently subversive schemes. Donald Trump has said on numerous occasions that the Trump movement is not about him; it’s about We the People. That the patriotic American people are the movement and, therefore, it is they who are obligated to TAKE BACK THEIR COUNTRY. How can Donald Trump possibly do that as one man? He doesn’t even know who he can trust in his own administration, or his own family. Deep State can take over anyone, at any time, and often the victims don’t even know it. This is the challenge which every POTUS encounters in the West Wing bubble, but with Trump it has been magnified considerably. The President needs US. He needs our help badly! Actually, he needs US now before it’s too late. Here’s how he has fared thus far in draining the swamp. Draining the Swamp: Who won the first round? Hence, it is time to formulate a workable game plan that preserves the Trump presidency because any other alternative does not look good. Even VP Pence is a dyed-in-the-wool Neocon surrogate according to the public record which documents his positions on foreign affairs. The USA cannot afford another warmonger and Israel Firster—not now, not ever. Hopefully, President Trump will also break that spell for good; for it still seems to have a hold on him. In the meantime, let’s get busy rebuilding the Second Continental Cyber-Army. This war is an unparalleled, asymmetric info war, and whoever leverages the most bandwidth will ultimately be the victor.